Stainless Steel Channel - Hot Rolled C Channels | Stainless Shapes, Inc. Stainless steel channel offers a wide variety of features and come in a variety of dimensions at Stainless Shapes. Stainless steel channel is shaped using a vertical web with top and bottom flanges at a 90-degree angle to the web and inside radius corners to increase the channel’s strength. Channel can be hot-rolled, extruded, or laser-fused. The following benefits and features make stainless steel channel a great choice for a wide range of industries and applications. Stainless steel channel dimensions that need consideration are the same dimensions that apply to each of our products. There is height, width, thickness, and length; these all need to fit certain measurements. The height and width are key factors in deciding what kind of channel you need for your application. Depending on your application and industry, there are two kinds of channel to choose from, U-Channel and C-Channel. 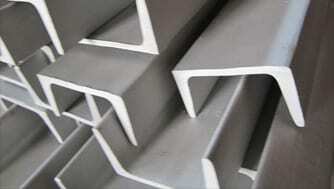 Though there are no specific terms, generally the parts of stainless-steel channel are called ‘body’ and ‘legs’. A long body with short legs is a ‘c’ channel, while a short body with long legs is called a ‘u’ channel. Stainless C channel can withstand corrosive environments and is best used around chemicals, acids, and salt water. 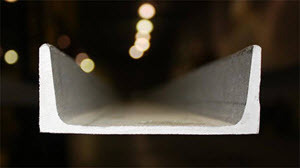 The material is available in laser fused non-tapered or Hot Rolled tapered. U channel is offered in laser fuse non-tapered with smooth bead blast finish. Stainless Shapes offers customer made to order U channel up to 40’ long. Contact Stainless Shapes today for more information! When it comes to our stainless-steel channel, our mission has always been to supply the top materials with the most honest service in the stainless steel industry. Being family owned for over a decade and having over 25 years of experience only proves the point more that we are the best choice in the industry.